Callie was struggling with reading and had difficulty with homework. She had lots of frustration with things that should be easy for a second grader – everything was a struggle for us. 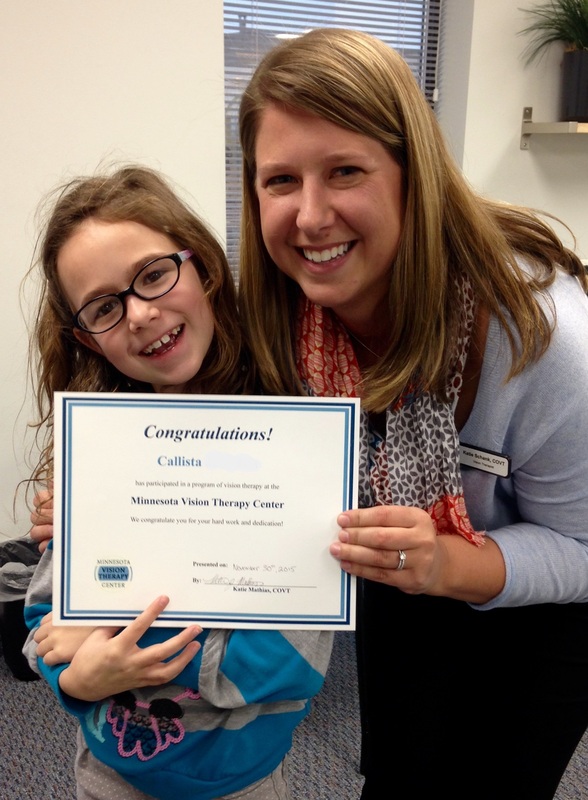 A friend told us about vision therapy and we came in to be evaluated and what a difference it has made! Her reading has improved drastically, and her behavior has settled down a lot! The doctor thought she might have ADD at one point and through vision therapy, her jitteriness and antsiness have settled down dramatically. Vision therapy has helped so much! If another parent were considering vision therapy, I would tell them just to come in and find out what it is all about. We didn’t know anything about it when we came here, and I’m so glad we did. It has been the best thing that has ever happened to us! It has been the best thing for her abilities at school and how she is going to succeed in the future. Callie’s mom emailed us to let us know the successes that they are still seeing after finishing their program this past fall. I was struggling with reading and the words would fall off the page. Everything is better. My reading is better, my handwriting is better. Everything! Vision therapy is fun! And magic eyes. You should try it. It’s really fun and your therapist will be nice and your parents can come with you if you want. It really helps.